"Eat, drink, man, woman. Basic human desires. Can't avoid them. All my life, every day, that's all I've ever done. It pisses me off. Is that all there is to life?" 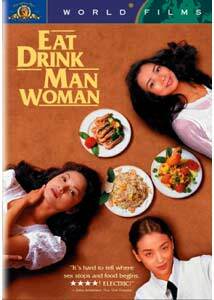 Eat Drink Man Woman begins with a lush montage that conveys the sights and sounds of exquisite food preparation. Master chef Chu (Sihung Lung) slices vegetables delicately, readies the mouth-watering meats, and cooks a premier soup. Although he's no longer a young man, Chu still possesses the skills and mentality to succeed as a top gourmet. Unfortunately, these attributes will not gain him peace with his three adult daughters, who each has her own specific diffiiculties in life. While he spends hours organizing the ritual of Sunday dinner, he is not able to speak directly with them about emotional matters. While they sit and slowly take in the impressive feast, the personal tension is obvious and lessens the impact of the cuisine. Ang Lee mesmerized audiences with the beauty and unbelievable martial arts of Crouching Tiger, Hidden Dragon, which took home an Oscar® for Best Foreign Film. He has also achieved success in the States with the costume drama Sense and Sensibility and the intense family struggle of The Ice Storm. Both films succeed due to deliberate, engaging stories with realistic characters. This connection to actual life exists strongly in this story, which provides entertainment and says something tangible at the same time. While emotionally heavy, there's also a captivating sense of joy that springs from the basic elements of life. Cooking can be mundane, but the sequences here provide a type of magical excitement that mirrors more fast-moving films. Much of Chu's family life follows a typical routine that keeps everything simple and understandable. A widower, he lives with his three daughters and refuses to let them enter the kitchen. When he prepares food, there's a proper balance to the world that does not exist in his personal relationships. Every morning, Chu wakes each daughter at an ungodly hour and basically makes them get out of bed. Next, he jogs around the impressive sites of Taipei and gets a chance to at least slightly interact with society. Even when he's called in to save the day at his friend's busy restaurant, Chu is all business and focuses solely on the task at hand. One exception is the relationship with fellow chef Wen (Jui Wang), an old friend who shares many of the same qualities. However, when Wen's health becomes a problem, Chu must look inward and see if something is missing in his own life. Although they share a familial bond, Chu's daughters could not have more different personalities. Jia-Chen (Chien-Lien Wu) is a modern, attractive businesswoman who desires independence from the saddening elements of her father. She decides to purchase an apartment and leave the confines of home, but both personal and professional obstacles arise to block her path. Her demeanor is confident and brash, but Jia-Chen struggles with her inability to connect emotionally with her father and sisters. On the opposite end of the spectrum is Jia-Nang (Yu-Wen Wang)�the youngest girl in the family at the age of 20. She still believes in the power of love, and is optimistic about a budding relationship with a boy. Unfortunately, his former girlfriend remains a good friend of Jia-Nang. Can their relationship succeed? Finally, school teacher Jia-Jen (Kuei-Mei Yang) takes constant insults from her sisters and other associates about her lack of a husband. Her quiet demeanor rarely responds to the ribbing, but it obviously effects her and makes her more introverted. She meets a local volleyball coach, but he couldn't possibly be interested in her. Could he? Her eventual positive transformation is one of the highlights of this wonderfully multifaceted tale. Eat Drink Man Woman could succeed solely on its food sequences, which are some of the best ever presented on film. However, it offers so much more in its elegant story about love and courage. Some of my favorite moments contain zero dialogue and simply include a few facial expressions or attractive shots. There are intricate details within the Taipei landscape that do not further the plot, but are essential in creating the proper atmosphere. Each sister is a nicely defined character with her own ambitions, and their father's quiet countenance is sharply textured. Although his girls pity him and suffer through his flaws, there is more lurking beneath his calm exterior. Nothing is simple for anyone in this film, and it leads to a compelling viewing experience. Image Transfer Review: Eat Drink Man Woman features an excellent 1.85:1 anamorphic widescreen transfer with few noticeable defects. The sumptuous food offerings shine with lively colors and appear with remarkable clarity. The outdoor scenes in Taipei showcase plenty of attractive scenery, and it really comes alive in this impressive transfer. The black levels are solid throughout the picture, and the images are sharp with few specks of dirt or grain. A few moments are a bit too dark, but they occur rarely and fail to distract from the overall presentation. Audio Transfer Review: The sounds of cooking spring from each corner of this 2.0-channel Dolby Surround transfer. Steam rises steadily from the pot, and you can almost smell the attractive scents. This audio track exudes a nice complexity and impressively captures the sounds of Taipei. Although much of the story is told quietly, the melodic sounds still help to create an exciting atmosphere. While Chu Jia-Jen stands waiting for her bus, the classical music playing on her headphones springs powerfully from each speaker. This transfer may not possess the power or depth of the best entries, but it does successfully convey the magic of this stirring tale. Extras Review: Eat Drink Man Woman's only notable supplement is a 14-minute featurette entitled A Feast for the Eyes: Ang Lee in Taipei. This piece contains interviews with Lee and writer James Schamus and offers some scenes from the film. Both of them discuss the production and the overall story. Lee was the first son of his parents in Taiwan, and he spent a good deal of time working at home and cooking before his career blossomed. His comments are open and involving, and it's once again clear why his movies connect so well on a personal level to world audiences. This disc also contains the teaser and theatrical trailers for this picture. I find it intriguing to notice how Hollywood studios market foreign films, and their previews are often misleading. They obviously tried to sell this movie as a fun, quirky romantic comedy with little substance. Unfortunately, they miss much of the beauty and weight in Lee's vision with this method. Both trailers come in decent 1.85:1 widescreen transfers with silly, overdone narration accompanying the images. Ang Lee is quickly becoming one of my favorite directors. He bolsters intriguing stories with the human elements that often are missing from Hollywood films. The artistry is excelllent, but it does not overwhelm the characters and the plot. Fans of his more recent American films should definitely check out Eat Drink Man Woman, even though there are no flying acrobatics through the trees this time.